»college fair»FREE College Fair in Queens This Saturday! FREE College Fair in Queens This Saturday! The Queens Public Library (QPL) will host more than 20 colleges, universities and trade schools at its 4th Annual College Fair this Saturday, April 16th from 10 a.m. to 3 p.m. 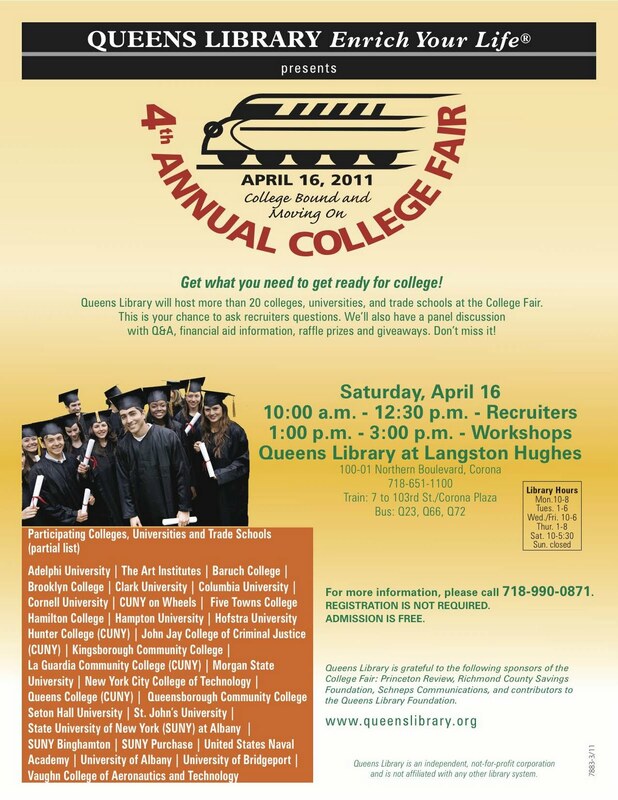 The college fair will take place at the QPL’s Langston Hughes branch, 100-01 Northern Blvd in Corona, Queens. This is a FREE event and you registration is not required to attend. For more information, please call 718.990.0871. ← Let’s Move, Get in Shape for the Summer!